This article is about a past parliament of Germany. For for the structure the body meets in, see Reichstag building. For anything else, see Reichstag (disambiguation). The Reichstag ("Diet of the Realm"), officially the Großdeutscher Reichstag ("Greater-German Reichstag") after 1938, was the pseudo-Parliament of the Third Reich from 1933 to 1945. Following the Nazi seizure of power and the passing of the Enabling Act of 1933, it met only as a rubber stamp for the actions of Adolf Hitler's dictatorship — always by unanimous consent — and to listen to Hitler's speeches. In this purely ceremonial role, the Reichstag convened only 20 times, the last on 26 April 1942. The President of the Reichstag (German: Reichstagspräsident) throughout this period was Hermann Göring. During this period, the Reichstag was sometimes derisively referred to by the German public as the "teuerste Gesangsverein Deutschlands" (the most expensive singing club in Germany) due to frequent singing of the national anthem during sessions. To avoid holding scheduled elections during World War II, in 1943 Hitler extended the term of office of the current Reichstag (elected in late 1938 to serve in 1939–1943) to serve a special eight-year term ending on 30 January 1947. The former practice became more and more common after 1930. Due to the Reichstag's complex system of proportional representation, it was extremely difficult for a government to have a stable majority. Frequently, when a Chancellor was voted out of office, his successor could not be assured of a majority. As a result, Chancellors were forced to use Article 48 simply to conduct the ordinary business of government. Following the Reichstag fire on 27 February 1933, Hitler used the President's Decree for the Protection of People and State to suspend civil rights. When elections in March did not yield a Nazi majority, Hitler pressured the Reichstag to pass the Enabling Act of 1933, which allowed the government — in practice the Chancellor — to enact laws on its own authority for a four-year period. With certain exceptions (which were in practice disregarded), those laws could deviate from articles in the constitution. Though formally only the Government as a whole could enact laws, Hitler in effect exercised that right by himself. The Nazis used the provisions of the Reichstag Fire Decree to arrest all deputies from the Communist Party of Germany (KPD) and detain several deputies from the Social Democratic Party (SPD). Several other SPD deputies saw the writing on the wall and fled into exile. Ultimately, the Enabling Act passed by a margin of 444–94, with only the SPD voting against it. However, the Nazis had negotiated with other parties so that even if all 81 KPD deputies and 120 SPD deputies had been present, the Enabling Act would have still passed by more than the two-thirds majority required. Before the summer was out, all other parties had either been banned or intimidated into closing down, and the Nazi Party was the only legally permitted party in Germany. In the parliamentary elections of 12 November 1933, voters were presented with a single list from the Nazi Party under far-from-secret conditions (see below). The list carried with 92.1 percent of the vote. As a measure of the great care Hitler took to give his dictatorship the appearance of legal sanction, the Enabling Act was subsequently renewed by the Reichstag in 1937 and 1941. The Reichstag only met 12 times between 1933 and 1939, and enacted only four laws—the Law for the Reconstruction of the Reich of 1934 (which turned Germany into a highly centralized state) and the three Nuremberg Laws of 1935. All passed unanimously. It would only meet eight more times after the start of the war. The actual Reichstag building (German: Reichstagsgebäude) was unusable after the Reichstag fire, so the Kroll Opera House was modified into a legislative chamber and served as the location of all parliamentary sessions during the Third Reich. It was chosen both for its convenient location facing the Reichstag building and for its seating capacity. The Kroll Opera House was devastated by Allied bombing on November 12, 1943 (coincidentally, the tenth anniversary of the first Nazi Reichstag's election). It was then essentially destroyed in the Battle of Berlin in 1945. The federal election in March 1933 was the last all-German election prior to World War II that was at least partly free. From then on, while elections were still held, voters were presented with a single list comprising Nazis and "guests" of the party. These "guests," however, fully supported Hitler. Elections during this time were not secret; voters were often threatened with severe reprisals if they failed to vote or dared to vote no. Under the circumstances, the Nazi list carried with well over 90 percent of the vote each time. Until enactment of the Nuremberg Laws in 1935, Jews, Poles and other ethnic minorities still held nominal citizenship rights. Not only were they allowed to vote, but in districts known to have large populations of minorities the Nazis often abstained from engaging in tactics used elsewhere to compel the electorate to vote in favour of the regime. In essence, the Nazis tacitly encouraged minorities to vote against them so that their propaganda could cite the relatively unfavourable results in districts known to have large minority populations as proof of disloyalty to the Reich. 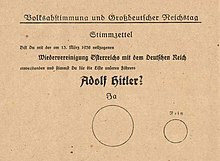 Following the enactment of the Nuremberg Laws, Jews and other ethnic minorities were excluded from the electoral process altogether and the number of negative and invalid votes recorded fell dramatically – from more than five million in the referendum held in 1934 to barely half a million in the vote held in 1936. Special referendums were held, under similar conditions. The most famous of these was the plebiscite on the Anschluss with Austria in 1938. That vote officially recorded a 99.7% "yes". Following the Anschluss, the Reichstag became the Großdeutsche Reichstag (roughly translated the Greater German Imperial Diet). In accordance with the provisions of the Weimar Republic electoral law of 1933, one seat was granted for each block of 60,000 votes. Because voter turnout was very high, and also because of new territories added to the Reich, and finally because the voting age was lowered (a compensatory measure adopted prior to the 1936 election to prevent the electorate from shrinking in size as a consequence of the Nuremberg Laws), the Reichstag grew to significantly greater and greater proportions. Finally, there were 855 deputies; Adolf Hitler was No. 433, elected to the Reichstag constituency 24 Upper Bavaria – Swabia. 1933, 5 March: General parliamentary elections immediately following the Seizure of Power. Six days before the scheduled election date, the German parliament building burned in the Reichstag fire. Opposition parties were thwarted in their campaigns. The Nazi Party won 33 of the 35 direct seats from parliamentary districts and 43.9% of the overall vote, giving the Nazis together with the DNVP (8.0% of the votes) a slight majority of seats. 1933, 12 November: Parliamentary elections and referendum on the withdrawal of Germany from the League of Nations. All Reichstag delegates are now Nazi Party members or sympathizers. According to formal results, 92% of the voters approved the referendum proposal. 1934, 19 August: Special Plebiscite to retrospectively approve Adolf Hitler's assumption of the powers of the President, following the death of Paul von Hindenburg. 88.1% of the voters voted yes. 1936, 29 March: General parliamentary elections and referendum retrospectively approving the Remilitarization of the Rhineland. The election and the Rhineland occupation were combined in a single question. 1938, 10 April: General parliamentary elections and referendum retrospectively approving the annexation of Austria Anschluss. Elected to serve for a four-year term beginning in 1939, it convened for the last time in early 1942. 1938, 4 December: Parliamentary by-election for newly acquired territory of Sudetenland. Like the previous occasions, the Nazis won all seats in this last election under their rule. The Großdeutsche Reichstag convened for the last time in the Kroll Opera House on 26 April 1942. It unanimously passed a decree proclaiming Hitler "Supreme Judge of the German People," officially allowing him to override the judiciary and administration in all matters. Any last remnants of the privileges of the Reichstag's members were removed and the Führer became de jure the final decision-maker, with the power of life and death over every German citizen. In practice, this merely legitimized a situation that had been in place since 1933. For all intents and purposes, this extended the provisions of the Enabling Act indefinitely. On 25 January 1943, five days before the expiration of the current Reichstag's term of office, the inauguration of a new body was postponed for another electoral term until 30 January 1947. This was to avoid holding elections while the war was still underway. With the Nazis' defeat in the war, the 1938 elections were the last for the German Reichstag ever, and would be the last all-German elections until the first elections for a reunified Germany in 1990. ^ Statistisches Reichsamt. Statistisches Jahrbuch für das Deutsche Reich Band 1941/1942. Berlin, Germany: 1943. Pp. 659. ^ Moonis Raza. Geographical Dictionary Of The World In The Early 20th Century With Pronouncing Gazetteer (in 2 Vos.). New Delhi, India: Concept Publishing Company, 1990. Pp. 712. ^ "Die propagandistische Vorbereitung der Volksabstimmung". Austrian Resistance Archive. 1988. Archived from the original on 2007-04-04. Retrieved 2007-03-11. This page was last edited on 7 March 2019, at 05:56 (UTC).